Adda is back. I’ll try to update my English Adda as I’m really occupied with my Bangla Adda. It is a sad news again in Bangladesh. 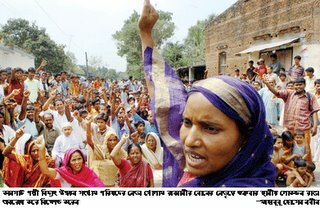 People in a small district of Northern Bangladesh are fighting for an uninterrupted electricity supply, so that they can continue their irrigation project. Read more information also from Daily Star. May be someone needs to look back that this same area experienced mass peasant’s movement almost 60 years ago. History still highlights about Nachole Krishak Andolan (peasants' movement) organised by ila mitra in 1949. Is it another phase of peasants’ movement? It is time that more Golam Rabbanis come up to provide a platform for these suffering poor people to stand up against these corrupt local officials.